We offer professional photography services for all occasions. 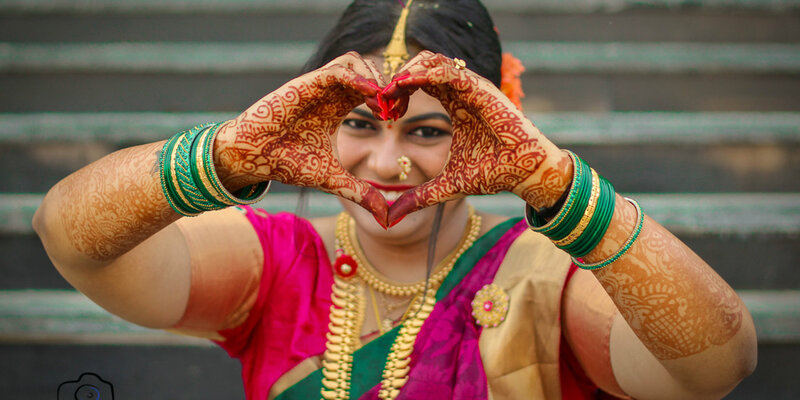 We specialize in Hindu Wedding, Candid Wedding, Pre-wedding Shoots, Couple Portraits, Bridal Portraits, Indiancandid Wedding, Kids Portraits, New Born, Babies & Kids, Model Portfolio, Portraits, Fashion & Portfolio, Adventure, Destination/Sights, Travel, Wildlife, Flora & Fauna and Nature photography and have been in the business for 1 year now. Apart from regular photography, we offer products and services such as CD / DVD. We cover events in Karnataka, Andhra Pradesh, depending on the requirement. We are comfortable communicating in Telugu and English. The performance is beyond our expectation. We are really happy with the pictures taken by chaithanya, all the pictures look very natural and he was very respective on taking our ideas too, he was very friendly and we enjoyed a lot during the photo shoot......I would really recommend chaithanya! God bless that marriages are made in heaven. But chaithanya pic made us together forever. Beautiful experience with chaithanya's Photography.talking towards made us happy. Chait photography was excellent. We like to call him for my first babies naming ceremony photography also. Chait's professional photography made us happy. ???? Pics editing is very natural & looks wow. His humble nature makes us more comfortable with our shoot. He brings many props which add extra creativity to our shoot. We took a pre wedding photoshoot with chait,had very gud experience and I love the photos. As I can feel the way of love we made that comes out in a realistic way. He has a great eye point of creating a perfect shot. We would definitely suggest to our frnds as well. Thanks you chait for loving pictures u made . ?? Chaitanya is very professional but at the same time he is a very sweet person. Very soft spoken, patient and co-operative. Ideas for the shoot were very good and we also loved the quality of the pictures. He is on time with good props.... I like his dedication and working skills in photography.. I would definitely recommend this photographer to my people. When it comes to shoot day preparations, the venue he suggested was really good and comfortable for us. Though the venue guys charging it bit higher. But Chait was ready for us to make the decision on the venue. Then regarding the properties and costumes he gave us all the recommendations to get the photos look colorful and vibrant. Most of the props were arranged by himself which was awesome. He was also very open to take our suggestions and wishes with the props and costumes. That makes him a friendly photographer which is one of the most important factor to choose him. He was very punctual in time as well! I too have the passion on photography but just in learning stage as hobby. So I look for the color shades that the photographers use in their post processing. Chait's taste of color shades are pleasant to me. It was not too much vibrant which is what I wanted. Great work Chait! You did a good processing effects. We will definitely recommend you to our friends in future. Thanks a lot. Good luck in your future works. We had an exception experience with Chaitanya during our photoshoot and baby shower. He had a variety of props, which were efficiently used and made our pics memorable. He also accommodated all our inputs. Amazing guy. And what a photographer. He makes sure every frame has a story. Just too good. Me and wife are impressed. We have seen a lot of photographeres, I myself do small time photography works. But his is one of the finest I have seen. First of all I want to say thank you Chait, all photos are wonderful. Chaitanya made us very much comfortable while taking pre wedding photos, his suggestions of selection the right kind of dresses for the occasion was perfect. We highly recommend chait photographer to everyone. We recently took the services from Chait Photography to click few family pictures.Must say,the photographer,Mr.Chaitanya was at his best to ensure the entire photoshoot took place perfectly.His eye to keen detail,his patience,willingness to bring out the best shot everytime is sure to take him places.We highly recommend Mr.Chaitanya as he surely knows the mind of a photographer and the clientele.Wishing him good luck and many more best captures and happy clientele. Over-all great experience with chait photography. Had a great time and I love his creativity. Photos came out fantastic. Thanks for such a wonderful lovely moments Chaitanya. We will definitely hire you again. Thanks to canvera. This photographer really got skills by which i can say that , 'Camera in his hands' is like 'bow and arrow in Arjuna's hands'..to that that level is the perfection.I recommend him for any kind of photographic session. Very professional, calm and patient. He gave ample time required for every photo. Results were awesome. Me and my wife both liked the service very much. Overall a good experience in his session. We were very happy that all the photos are too good more than what we expected it to be. I highly recommend him for any kind of photography. Hi Thank you so much chaitanya. Got my first professional photo shoot done and I'm glad it was with Chait Photography. Chaitanya is a pro at what he does and he does it out of love for photography. Pictures came out terrific and almost everyone I knew liked them so much. It was fun working with him right from the beginning to the end of the session and he sure knows how to maintain a good customer relationship. Thank you for the pictures Chaitanya and look forward for next post-wedding shoot. Thank you Chait for the wonderful memories captured.Feels like watching the pictures again and again. :). You were really patient enough to listen our requirements and capturing them. We made the right choice by choosing you for our shoot. It was pleasure doing shoot with chait. Very professional and creative in his work. Will not stop till he get the perfect shot. You will be tired of giving poses but he won’t be tired. Loved his work. I would definitely recommend him. Photography was good.. the quality of the pics was nice. Photographer was very polite during the session. I shall recommend the photographer to my friends for sure. Got my first professional photo shoot done and I'm glad it was with Chait Photography. Chaitanya is a pro at what he does and he does it out of love for photography. Pictures came out terrific and almost everyone I knew liked them so much. It was fun working with him right from the beginning to the end of the session and he sure knows how to maintain a good customer relationship. Thank you for the pictures Chaitanya and look forward for next post-wedding shoot. It was fun doing photo shoot with Chaitanya. Suggested dresses because of which photos came really well. I will recommend him for capturing your beautiful moments. Thanks to chait photography. He has great patience and the final processed photos are really awesome. I would like to suggest to my friends also. He gave me such a good coordintion from the beginning. Thanks alot chait. Chait photography is a great association to contact with. The photographer is very friendly and he has more creative thoughts. He gave us a chance to suggest him to others without any second thought. Very much impressed with chait photography. Chaitanya realy pulled it off. He was punctuall the day of the shoot and was professional through out . He was thorough in covering all the poses and guided us through it. I really loved the pics. Thanks to both Canvera and Chaitanya ... Bigger thank for Chaitanya . We impressed with his creativity service and charges on time excellent we would like to suggest to all my friends and family’s members ,photo finishing good and Patience. The photography was memorable and very good. As my relatives and friends liked it. Photographer arrived on time and there was a good understanding about the perfect image of the photography. According to my thoughts, the complete picture was presented by the photographer. Thank you for making a memorable day by capturing such memorable pictures. We engaged with Chaitanya for a pre wedding shoot. Very professional and calm , He made us feel relaxed and comfortable. Thank you Chaitanya for capturing Precious memories of our life so beautifully beyond our expectations. I would highly recommend Chait Photography to my frndz to capture their beautiful memories. Right on time. Very patient. Good work. Nice properties. Had a great time and excellent photos to cherish our precious moments. Follow up and service is great. Great Photographer! Great creativity and beautiful natural shots. He makes us feel relaxed and comfortable. The final product we get proves the passion he has towards photography with perfection. Would like to recommend him to my friends too. The photos clicked is a treasure. We were engaged with Chaitanya for a Pre Wedding shoot. He made us soo comfortable and understood our requirements well. Passionate guy towards photography. Impressed with his creativity. Thank you Chaitanya for capturing wonderful memories of our life soo beautifully beyond our expectations. I would strongly recommend Chaitanya for any kind of photo shoot. Very professional and calm. Works at the clients ease and comfort. We were asked to come early in the morning for the shoot and Chaitanya was already there waiting for us. It was a great experience getting the photoshoot done with him. Chaitanya made us very comfortable and we really had fun. Will surely recommend Chaitanya Photography to my friends. It was a memorable experience and also the picture processing is impressive. Chaitanya was easy to work with. He seems pretty creative and works towards making the shoot comfortable. Flexible with time and tailors deliverables to your needs. We engaged with Chaitanya for a pre wedding shoot. Right from the beginning he was clear with the communication regarding what kind of pics. He was on time at the location. Chaitanya understood and was able to tide over our camera awareness and was able to get some wonderful memories clicked. The pics are a testament to his ability as he understands the nuances of lighting and the subject. Your message was successfully sent to Chait Photography. The Photographer may contact you soon.